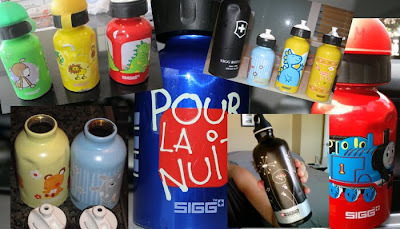 We've virtually been inundated with SIGG bottles. Honest. We've never seen so many - in online photos. The response to our BPA-free bottle promotion has been fantastic, which means we've received loads of photos of your SIGG bottles with BPA in the lining. We've got pictures of all kinds of SIGGS - all colours, all sizes, some with Thomas the Tank Engine, others with French. 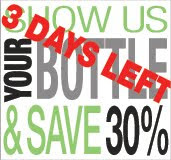 In return, we've sent you a unique code for 30% off any of our BPA-free water bottles. And for those of you who don't have a SIGG but still like to buy top quality, BPA-free water bottles we've been responding to your emails and sending you a unique code for 20% off our stainless steel Thinksport bottles or our European-made Laken water bottles. Now we're extending our offer until midnight PST Monday, September 28th. So great news for all of you who haven't had a chance to take a pic of your SIGG just yet, you've got this weekend to do so then simply send it to us at customerservice@lavishandlime.com. Or just email us, asking for the 20% off code. Codes are valid for use through September 30th. SIGG's recent revelation about BPA in their bottle lining is unfortunate, we're just happy to have teamed up with our bottle manufacturers to offer you savings on certified BPA-free alternatives. Read more about our BPA-free water bottle promotion here. Browse our collection of reusable water bottles at Lavish & Lime. If you have any thoughts or ideas about reusable bottles or Bisphenol-A, we'd love to hear from you! Just leave a comment below. Great selection of designs, colors and shapes. A quality product and no fears of what might come.